Health Habit # 2 is to be a fat burner. To obtain energy, the cells of the body can only burn Sugar or fat. Which one they burn makes all the difference in your long run! Although either fuel will work for giving you energy, FAT is (by far) the best energy source. It is the the fuel we should primarily utilize in our bodies because it does far less damage to our bodies than does burning sugar/carbohydrates. Ensuring that your body primarily burns fat is something that everyone needs to learn how to do. Burning fuel to create energy in our cellular mitochondria (power generating organelles that give us life) is necessary, but destructive to our mitochondria — by releasing free radicals (oxidants) This is very similar to how burning gasoline in an automobile engine is necessary, but destructive to the engine of the automobile, by releasing heat. Fat burns more efficiently than sugar. In fact, for the same amount of free radicals released, you can get twice as much energy from fat as from sugar. So, sugar burning destroys your body faster from the coincident production of free radicals. Fat burners are people whose bodies (cells) primarily burn fat as a source of energy. Sugar burners are people whose bodies (cells) primarily burn sugar as a source of energy, and will mostly ignore fat molecules (whether stored or circulating in the blood). Sugar burners have higher levels of blood sugar, which creates much higher rates of sugar-cross-linking of protein molecules, causing internal and external wrinkling of one's tissues, inflammation and stiffness, and premature aging and a hastened pathway to sickness and death. People with excessive percentages of body fat are almost always sugar burners because fat cells produce Leptin and high Leptin levels create Leptin insensitivity which triggers the sugar burning mode. To safely remain a fat burner it is important to maintain body fat percentages in a range that most be would consider low. 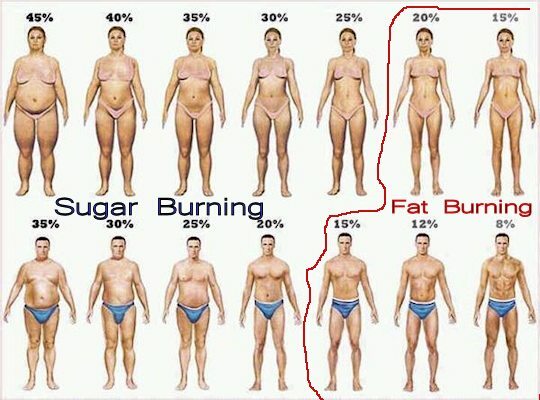 We recommend between 8% to 15% for men and between 15% to 22% for women. Sedentary people almost always eventually become sugar burners (unless they know exactly what to do keep Leptin low). That’s because 40 minutes of exercise stimulates fat burning (which sedentary people never do). We teach how to stay in the fat burning mode in a free E-booklet , which you can download below. People who almost constantly eating through the day and evening, and don’t give their bodies a 13 to 16 hour break from food each night, are most often sugar burners. People who eat lots of empty calorie foods are usually sugar burners. Sugar burns very fast and produces a lot of wasted energy in the form of damaging free radicals. Most of the body’s cells (brain cells are an exception) were designed to burn sugar only temporarily in times of exigency, when the damage from free radicals is not as important as dealing with the emergency. If our bodies had been designed to primarily burn sugar as a fuel, then we would store sugar cubes within our bodies, but we don’t, we store fat. We store only minor amounts of sugar (in the form of glycogen) — enough to last for 30 to 40 minutes of extreme exertion. If our bodies are in the sugar burning mode (meaning that they will ignore fat and wait for sugar to burn for energy), then, when we are asleep, since, there are no incoming sugars, our bodies will break down bone and muscle tissue to make sugar, in order to burn for energy. The breaking down of bone and muscle during the night is what causes muscle loss and bone loss, and is a primary factor in osteoporosis and aging. Being in a sugar burning mode causes an elevation of sugar in the blood, which causes glycation (alteration of our proteins) damage to our tissues. Glycation damage on the outside (unsightly brown spots) means that there is glycation damage on the inside as well. The amount of free radicals released as byproducts of energy creation is less. Fat can come directly from food eaten or the body can get fat from our stored fat. This is very important, because then we won’t lose muscle tone or bone density while we sleep. Unfortunately, most people’s cells are in a sugar burning mode, i.e. have been ‘conditioned’ to burn SUGAR, with a whole host of resulting bad consequences. Sugar burners often have large pantries of stored fat, but the cells of their bodies ignore that fat and look only for sugar. If there is no sugar available, such as when a person is sleeping, then the body will dismantle bones and muscles and convert those proteins in sugar to be burned for energy. This is the major cause of loss of muscle and osteoporosis as we get older. The unhealthy situation of being a fat burner is the result of the hypothalamus (energy controlling gland in the brain) signaling the cells of our bodies to ONLY burn sugar, instead of fat. This is the result of leptin hormone levels that have gone so high (above 9.0 ng/ml) that the hypothalamus has become unable to understand the leptin signals. Leptin is a messenger molecule made in fat cells that communicates to the hypothalamus to inform how much energy is stored in the body. Unless leptin levels go lower and stay between 4.0 ng/ml and 9.0 ng/ml, people will find that they continue to gain fat over the years until their cells become resistant to Leptin and Insulin. Eventually, such a person may become diabetic once cells are resistant and cannot easily convert excess sugar to fat. So, Leptin levels are THE KEY to everything regarding body fat management. Eat only enough carbohydrate to perform daily labors. For a fairly in-depth discussion about doing this, please request our Becoming Leptin Sensitive Booklet. For most people, training the hypothalamus to be sensitive to leptin again is a matter of retraining oneself to eat a better way. A great method of beginning the process of forcing your body into a fat-burning mode is the Eight Day Cleanse. The Eight Day Cleanse is simply unbeatable at creating a positive change in one’s health. Following the Eight Day Cleanse with our new Glycemic Support product and with L-Arginine are great ways to help heal hypothalamus damage so that the body will stay in a fat burning mode. The above sentence is perhaps the most IMPORTANT statement you will ever read in regard to health and longevity. Here is a simplified discussion on how to ensure proper hypothalamic functioning so that our cells can turn back into fat burners instead of sugar burners. We become sugar burners by eating sugar and carbohydrates until our leptin levels go so high that our hypothalamus stops listening to leptin and assumes that we are starving. If we are presently sugar burners and want to become fat burners, we must avoid sugar, fruit sugars and simple carbohydrates completely for a whole month, while simultaneously reducing our leptin levels by religiously fasting 12 to 13 hours per day (including sleep time), eating primarily protein and fat for breakfast, and striving for low blood sugar levels, until our hypothalamus is able to put our cells back into the fat burning mode. The single best way to do this is with the WIN protocol, which stands for Weight Loss Intensified Naturally. We stay fat burners by keeping our blood sugar low, fasting 12 to 13 hours per day and eating primarily protein and fat for breakfast. There is no other way to do this — one has to break the sugar habit! To break our cells’ habit of eating sugar, we have to for a time completely stop the supply of sugar and carbohydrates. We also have to strive to get our leptin levels below 9.0 ng/ml so that our hypothalamus will assist by turning off the mandate to burn sugar. We can get our leptin levels lower by supplementation by lifestyle change (as outlined in our free E-Booklet). Copyright 2008 - 2017 Healthy-Living.Org. All rights reserved.